On March 7th, we had the pleasant opportunity to visit the Saiyoji Buddhist temple in Arao. 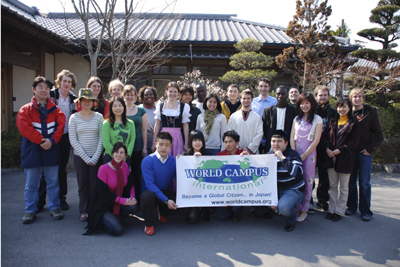 World Campus — Japan participants were split into two groups. One group prepared a traditional lunch with the temple staff, while the others played with the children in the nursery. Acknowledging my lack of culinary talent, I decided to have fun with the youngsters! The capable staff of the nursery cares for 100 children ranging from young infants to five-year olds. Although the nursery is right next to the temple, it is not necessary to be Buddhist to enroll your child in the school. Payment is really flexible depending on the financial status of the family. After a quick tour of the school in our tiny green slippers, we joined a class of three-year olds to create masterful works of ceramics. The creative clay cups made by the toddlers look a lot better than mine but looks aren’t everything. All in all, everyone had a wonderful time with the cute children. After a delectable lunch, made by the more skillful chefs in the group, six female members had the chance to try on kimonos. Although it was an arduous task to put on, they all looked enchanting in the traditional Japanese wear. Later in the afternoon, we were fortunate enough to listen to a lecture on Buddhism by Mr. Kamehara, the head monk of Saiyoji temple. The talk was quite interesting as he described the history and different sects of Buddhism. Although there have been many transformations as Buddhism traveled from India to Japan, the fundamental message of peace and mercy was preserved. We all have different religious backgrounds but everyone was still eager to learn even just a little about another religion. As thrilling as this day was, it is just a typical day in WCI!